Starting as a family-run workshop, Coach was founded in 1941 in a Manhattan loft. Six artisans handcrafted a collection of leather goods using skills handed down from generation to generation. Discerning consumers soon began to seek out the quality and unique nature of Coach craftsmanship. After years of expanding as a reputable leather goods brand, Coach went on to define “accessible luxury” for a generation. Beginning in North America, Coach delivered an alternative to traditional luxury. Then expanded beyond their home market, becoming the first American company in its category to bring international relevance to an American leather goods brand. This feeling of luxury being passed to each and every customer is translated in their retail stores. In their newly re-opened retail store in the King of Prussia Mall, the floor design speaks luxury and coziness with soft seating area rugs. By offering the softness of their premium leather into their seating spaces, Coach encourages customers to dwell comfortably in their store. We installed large area rugs that were inlaid with a beautiful cognac hardwood throughout. Our computerized cutting table utilizes precision ultrasonic blade cutting technology to bring your design ideas to life and make your retail space reflect your brand's message. With our huge library of available commercial carpets, we can custom-cut virtually any shape and pattern to make a rug that speaks specifically to your facility’s decor and style to give it that premium, custom look. 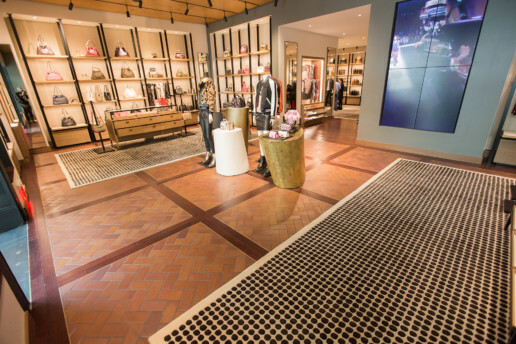 Retail flooring needs to be both attractive to your clientele and supremely functional while withstanding the punishing foot traffic most retail spaces see every day. 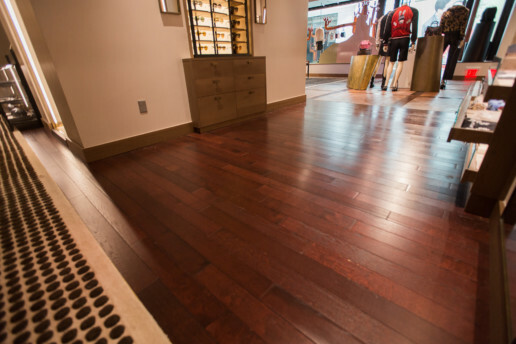 Ready to redefine your space with floors that are as impressive as the goods sold in your retail store? Contact us now. We are here to help.